Home / Boxing Bios / Ali’s Close Shave (r’s). Earnie Shavers. The 'Acorn,' as Ali had dubbed Shavers would be a prohibitive underdog. He was accorded a puncher’s chance at best against the aging but still crafty king of the heavyweights. What transpired the night of September the 29th, 1977 established Earnie as a legitimate contender and forecast the soon to be demise of 'The Greatest'. The playful Ali continually mocked Earnie during the pre-fight introductions by rubbing the top of the 'Acorn’s' head. The relaxed and confident Ali easily out boxed Earnie in round one and was doing the same in round two. Then out of nowhere, a crackling Shavers right hand stunned Ali and sent him wobbling backwards. Hurt and glassy eyed Ali waved Earnie in. Again Shavers landed with dynamite force staggering Ali. Only Muhammad’s tremendous heart, chin and cunning enabled him to survive the round. Action slowed in the middle rounds as Ali mugged to the crowd and several times he lay on the ropes and tried to lure Earnie in. Shavers refused to become a victim of the 'rope-a-dope' and the crowd booed wanting more action. They got it as the bout progressed past the seventh round. On numerous occasions, Earnie rocked the champion back on his heels with explosive right hand bombs. When Ali kept his distance, he dominated with sharp jabs and straight rights. Going into the late rounds Ali had the lead but in rounds twelve, thirteen and fourteen Earnie fought probably the best three rounds of his career. Several times he stunned a tired but dead game Ali. Many thought Earnie would tire since he had never fought past ten rounds but it was Ali who appeared to be wilting. The fifteenth round saw two desperate warriors engaging in a thrilling toe-to-toe slugfest. Ali seemed revived and Earnie was letting it all hang out in a last ditch effort to win the crown. Earnie edged Ali during the first two minutes of the round and then he finally tired. Ali came on and hurt Earnie for the first time in the bout. Showing a remarkable will to survive Shavers refused to fall although he was beaten around the ring. At last, the final bell sounded saving Earnie and putting his fate in the scorecards. The final scoring: 9-6, 9-6 and 9-5-1 in rounds won for the winner and still champion, Muhammad Ali. The crowd lustily booed the verdict. 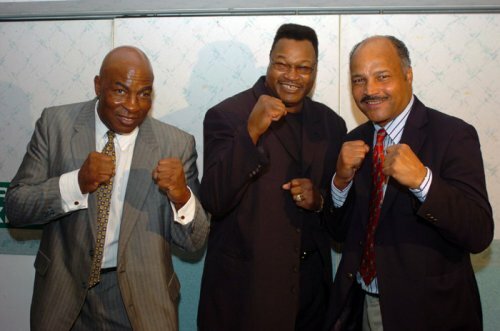 Whether you agreed or disagreed with the decision, one thing was certainly unanimous among the crowd: Earnie Shavers had arrived. Previous Freitas Return Ensures an Explosive December.